Home / News / Blog / Another happy customer! Here at DP Medical we’re always really pleased to receive positive feedback from our customers. 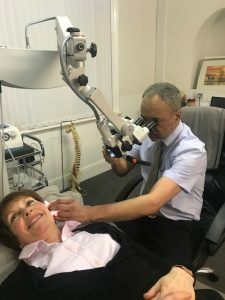 Jo Sunner, from the Pulse practice in Lincolnshire and Avicenna Clinic in Cambridgeshire, recently bought his very own Somron microscope from us. Jo tells us more about his experience. We’ve found with previous purchases that a seemingly good deal on a piece of equipment is no deal at all if it frequently breaks down or doesn’t serve long term operational needs. While price was important in deciding what to buy, our greater focus remained on quality and value. We have learned through costly experiences! Prior to buying our Somron microscope from DP Medical, we did look around carefully for suppliers of microscopes. Initially the Internet gave us access to a wide range of specialised e quipment companies. We attended a few trade shows where we got some hands-on time with equipment and also contacted industry associations for more information so not to let price alone guide us in our supplier decision. We considered post-sales service, a supplier’s reputation, and the time, money and resources required to train employees on the new equipment. We wanted to avoid the productivity drop that occurs when employees take too much time to adapt to new technology and the processes involved. This purchase was for brand new equipment and it had new features so we had to assume that employees would face a learning curve. DP Medical were very helpful in this regard providing training, as we needed it and it’s been a great success so far. Our opinion is that we now achieve better results in less time and the feedback has proved that it’s a better experience for our patients.